115/230V AC fully autonomous automatic control bias system ABS-Q+. Module ABS-Q+ for 4 tubes, PP & PPP amps, with a built in 6.3VAC AND bias supply, 115V or 230VAC powered transformer, fully autonomous. The model ABS-Q+ auto bias module is designed to optimize the bias for four triode or pentode output tubes in Push-Push (PP) or Parallel-Push-Pull (PPP) amplifiers that have their own negative bias supply circuit. Suitable for class A, AB, or B tube amplifiers. The ABS-Q+ dynamically controls the bias in four tubes. The module automatically optimizes the bias settings and maintains a strict symmetry of currents through both tube branches in the output stage. It will also stop any DC current flowing through the output transformers, all with the minimum of current loading on the anode of a tube. DC current saturates an output transformer which results in increased low frequency distortions. The bias level is kept at the preset value irrespective of the input signal. 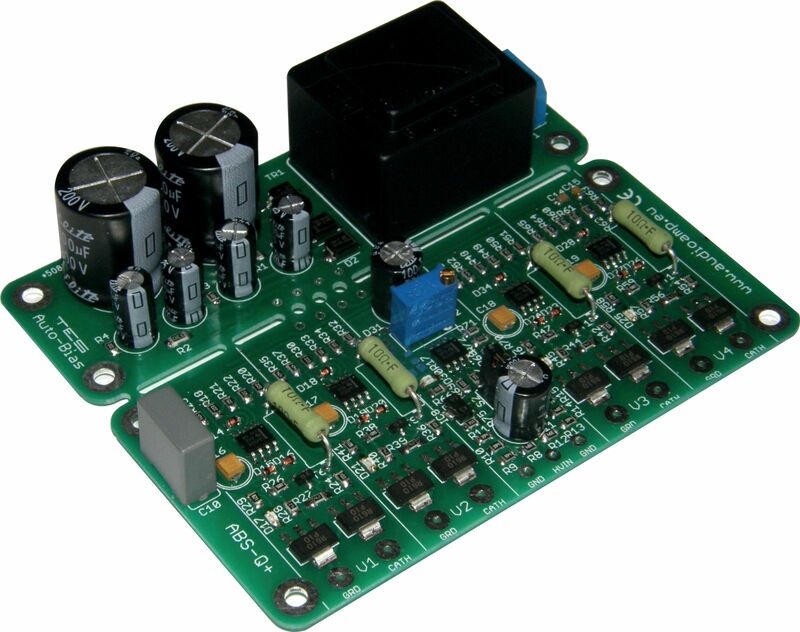 This module is completely autonomous as it has its own bias and 6.3VAC power supplies. The ABS-Q+ will operate with the filament supply in your amp reference to ground, such as a center tap, since it comes with it own power transformer! - completely autonomous, comes with its own bias and operating supplies! This module has been designed to maintain a constant bias voltage through all power output tubes for your tube stereo power amp. The bias is kept at a constant level on the output tubes, irrespective of the signal level. The advantage of using the ABS-Q+ module is that it will extend output tube life, in a lot of cases it will also improve the sound and last but not least, you will never have to worry about adjusting the bias again. The ABS-Q+ comes with its own 6.3VAC AND bias supply power transformer, so this auto bias module is completely independent! The ABS-Q+ module has four blue LED’s, one for each output tube, which when lit, indicate that bias is at the correct level and that all is good with each tube. Should any of these blue LED’s go out or not go on after power up, means that here is an issue with that given output tube and that the tube in question needs to be immediately replaced. When the amp is powered up, at first a red LED will be on, indicating that there is power to the ABF-Q module. The red LED will go out after about 20s. After a further delay of between 60-80s, each of the blue LED’s should come on indicating that the bias is now set and stable for each output tube. The amp is now ready to use. The ABF-Q is suitable for class A, AB and C tube amplifies. Before the ABS-Q+ module can be wired up, you need to preset its bias voltage. As an example, for EL34 tubes, we recommend a bias voltage of 425mA, for KT88 tubes we recommend 450mV. You will need to consult the tube specifications in order to determine the optimal bias voltage for the tube in your amp. This bias level is set using the blue colored trimmer on the ABS-Q+ module. We strongly recommend that you preset the ABS-Q+ module before you proceed with installing it into your tube amp! The ABS-Q+ has its own power transformer for the 6.3VAC supply as well as the -ve bias supply, so simply connect a pig tail power cord to the 115V mains terminals. Place your ABS-Q+ module on a non-conductive surface. Apply power to the ABS-Q+ module and you should see the red LED on the ABS-Q+ module light up. This LED will go out after about 20s. Set your meter to read DC and to the lowest scale, say 1V, 2V or 5V. Put the black meter lead on any GND pad on the ABS-Q+ module and put the red meter lead on the pad next to electrolytic capacitor, see below. Now adjust the blue trimmer until the desired bias level is achieved. That’s it, you just set the ABS-Q+ module to the desired bias operating level. To set the bias for an EL34 tube, the recommended anode current for AB1 class is 42.5 mA. We therefore set the bias at 425 mV (0.425 V). Unplug the power cord, wait for half a minute or so and disconnect the wires from the mains terminals on the ABS-Q+ module. DO NOT EVER readjust the trimmer once the ABS-Q+ module is installed and wired up. The whole idea is to set in ONCE and forget! Please refer to the drawing below, which shows a typical tube amps connection for your ABS-Q+ module. 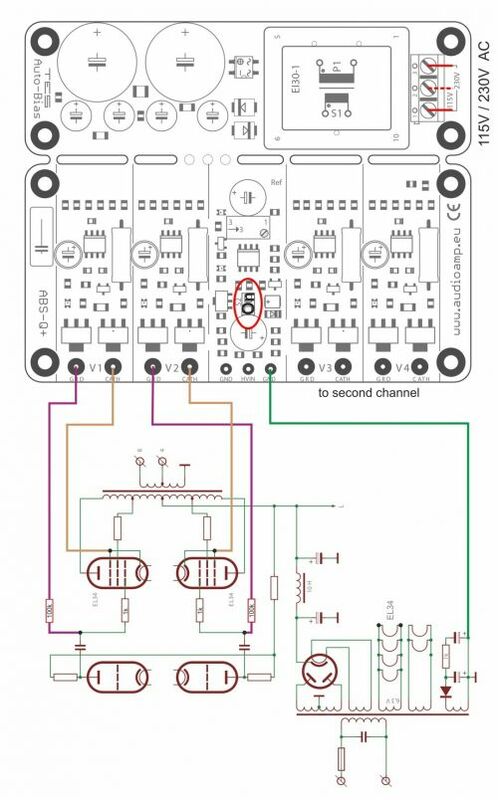 Use this diagram as a reference to the wiring of the ABS-Q+ module into your amp. Only one channel is shown, the other channel is identical. There is a jumper link on the ABS-Q+ module, shown as S2 in the above diagram. 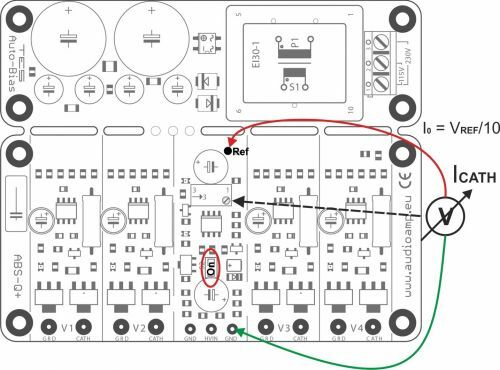 If your tube amp DOES NOT have a startup time delay, leave jumper S2 and DO NOT connect B+ to the HIV pad on the ABS-Q+ module, shown as a red wire in the above diagram. If your tube amp has a startup time delay in excess of the ABS-Q+ soft start time, ie more than 80s, REMOVE jumper S2 and CONNECT speaker B+ to the HIV pad on the ABS-Q+ module! This now pretty much completes the wiring of the ABS-Q+ module into your tube amp. Once you are confident that all your wiring is correct and as per the above steps, it is time to test your ABS-Q+ module installation. Plug in all tubes, that is the driver tubes, power tubes and the tube rectifier. In order to see the blue LED’s on the ABS-Q+ module, place your amp on its side. Maybe stick a piece of styrofoam under one of the output transformers to cradle the amp chassis so that the tubes do not touch the bench top. Connect an 8 or 4 OHM dummy load or your speaker. Power up your amp. The red LED on the ABS-Q+ module should come on straight away and will go out after about 20s. After an additional 60 to 80s, each of the blue LED’s on the ABS-Q+ module should start to come on, which indicates that each output tube has reached the preset bias level and all is good. Excellent! You can measure the actual bias voltage on each output tube with a meter just to double check. Set your volt meter to the 1V, 2V or 5V scale in DC volts. Put the red meter lead on the cathode pin of the tube socket and place the black meter to the chassis star ground tag. The meter should read close to your preset bias voltage. This reading might be a little higher to start with and will get close to or exactly to the preset bias voltage as the output tubes warm up. Do this measurement for each output tube. Leave the amp running for about 10 minutes, all four of the blue LED’s should remain lit. Power down the amp and let everything cool down a bit. Remove dummy load, if that’s what you used, or disconnect your speaker. Re assemble your amp and place it in its spot. Power up your amp and after about 60s or so, the amp is ready! Goods of the same category - Module ABS-Q+ for 4 tubes, PP & PPP amps, with a built in 6.3VAC AND bias supply, 115V or 230VAC powered transformer, fully autonomous. Automatic dynamic control bias system for push-pull (PP) amplifiers. Dimensions 100x100 mm. Your inquiry Module ABS-Q+ for 4 tubes, PP & PPP amps, with a built in 6.3VAC AND bias supply, 115V or 230VAC powered transformer, fully autonomous. 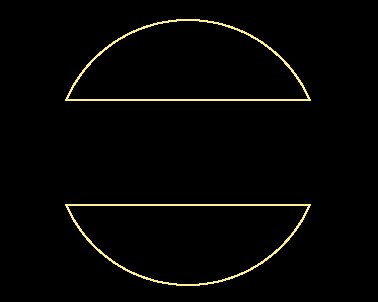 Modules for to optimize bias with an supply of bias AB-Q.